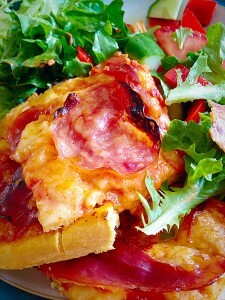 Hello lovely people, I have been wanting to share my Homemade Ciabatta Base Pizza recipe with you for ages. The trouble is I always forget to photograph the pizza once it’s cooked. I’m sorry, too many blonde moments! Yesterday though, I was resolute. That pizza was getting it’s picture taken no matter what. 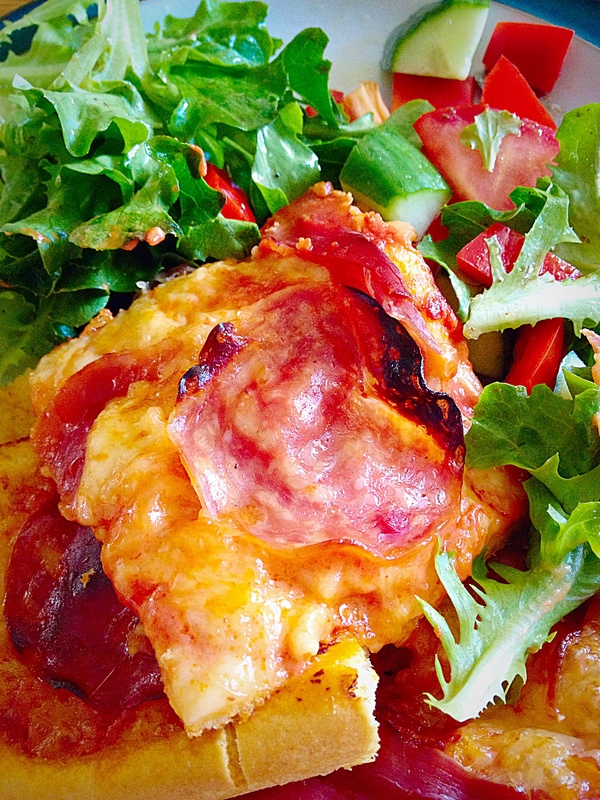 Homemade Ciabatta Base Pizza – topped with a Spanish selection of ham, salami and chorizo. 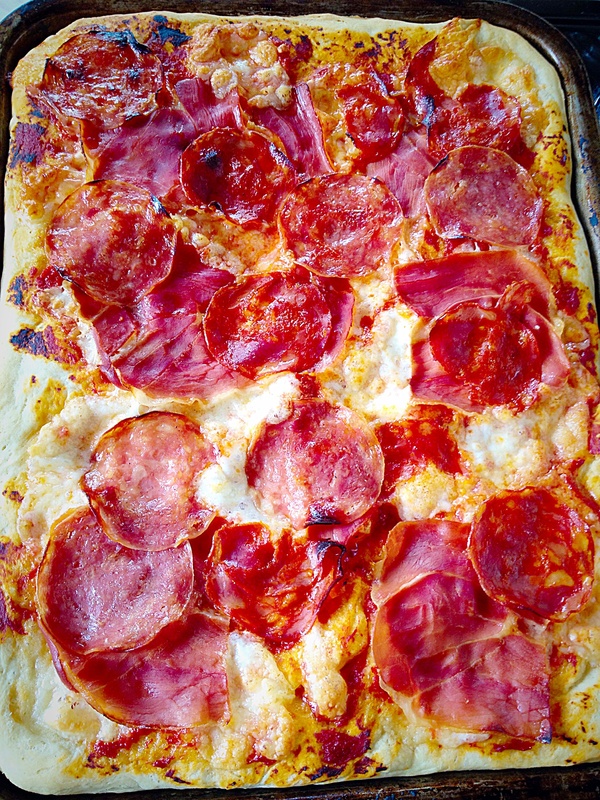 Now I have been making pizzas with our children and many of their friends who’ve come to dinner, since, well, they could stand on a chair and smoosh pizza dough about. Over the years we’ve had various shaped pizzas, including; guinea pigs, batman (and pretty much every superhero a little boy could think of), lemons, flowers, cats, hearts and many more. It’s a great cop out. Invite your children’s friends for dinner, then get them to make it. Firstly, they absolutely love it, secondly, I’ve never had a child who didn’t want to make their own pizza and lastly every single piece of their creation gets eaten. So no worrying about fussy eaters, just allow them to decorate their own pizza, whatever it’s shape, with a selection of toppings; pepperoni makes a great piggies snout. The perfect child friendly combination : messy hands, creativity, they eat their creation. Each child’s pizza is different and happy chatter over the dinner table deciding whose is the biggest, most realistic, it literally goes on and on. I kinda miss those days. 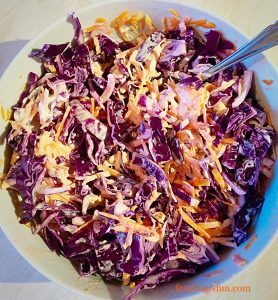 These days all 3 children can make large pizzas for the whole family, with a bowl of salad or homemade coleslaw to go alongside. 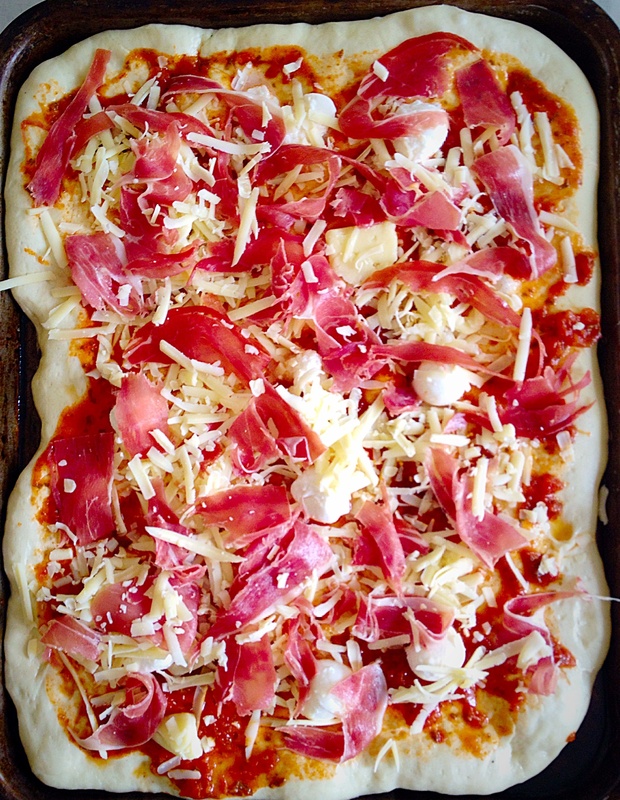 These pizzas are made from scratch except for one teeny tiny cheat. I use a 500g bag of Ciabatta bread mix, instead of making the pizza bases from scratch. I have made pizza dough in the past, but Wright’s Ciabatta Bread Mix gives such a fantastically crunchy, crisp crust, it really is my easy pizza dough of choice. Recipe: Makes 2 Large Homemade Ciabatta Base Pizza – serves 6 Adults. Toppings – I used a Spanish selection : Serrano ham, Chorizo and Salchichon – use whatever you like, mushrooms, meatballs, more cheese. Make up your Ciabatta pizza dough according to the packet instructions. I used my bread maker to mix, prove and knock back. Oil 2 x 38cm x 28cm (14″ x 11.5″) baking sheets. 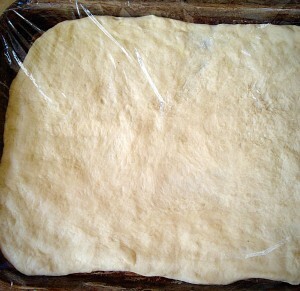 As soon as the dough has reached the knocked back stage tip the dough on to one of the baking sheets. 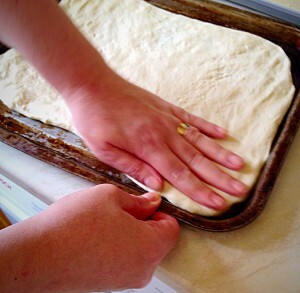 Rub the palms of your hands over the oiled baking sheet, this will stop the dough sticking to them. 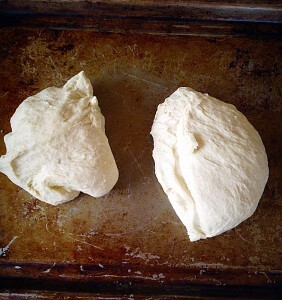 Using a dough cutter or knife, divide the dough in half. Now comes the fun bit. Especially for children or the child within us! 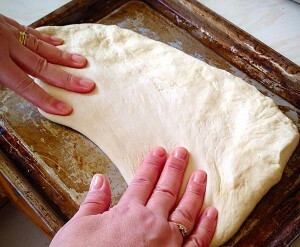 Using your hands pat the dough out so that it is flat. 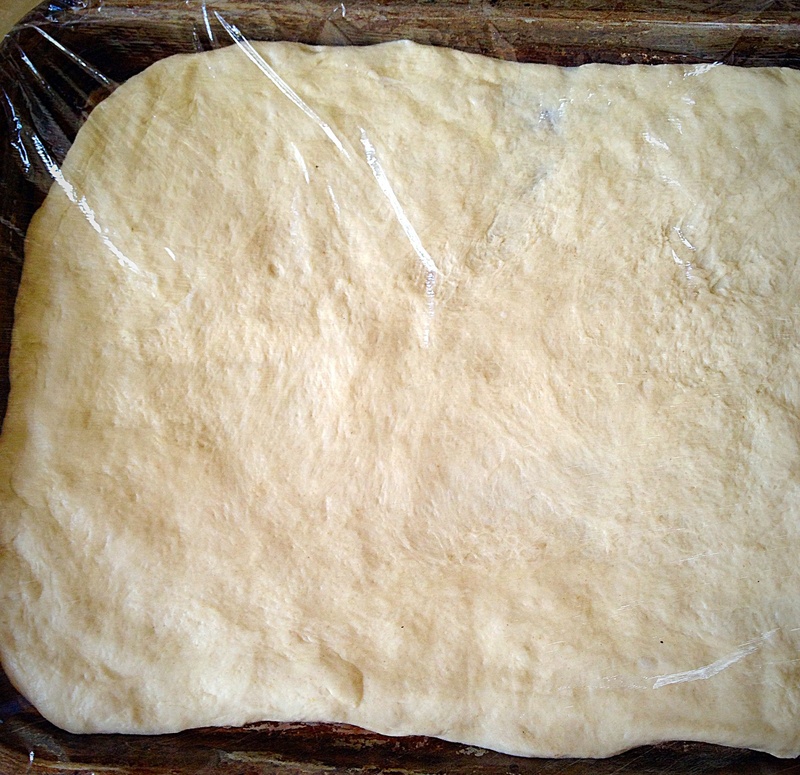 Work with the dough, gradually patting/stretching so that it reaches the edges of the baking tray. 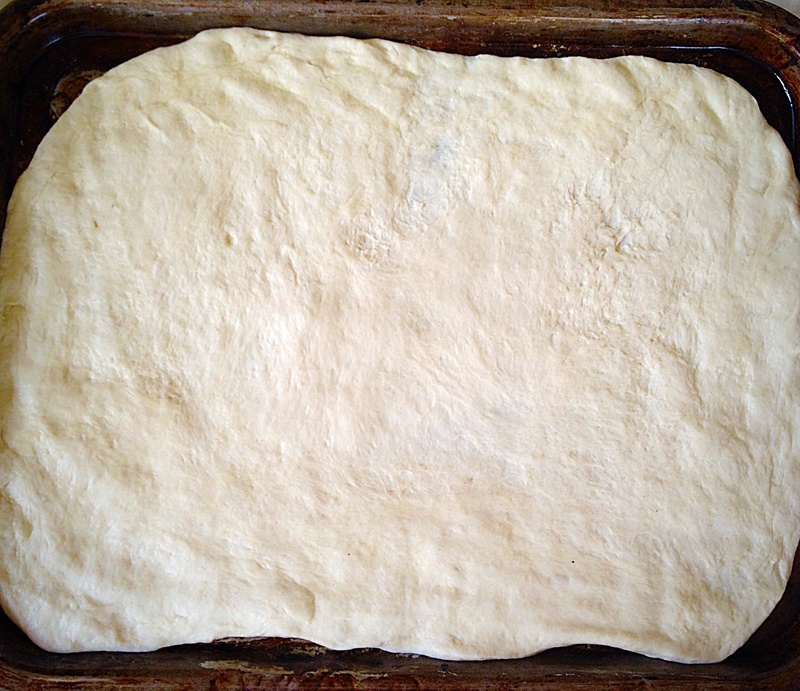 The base to your Homemade Ciabatta Base Pizza is complete! Drizzle a little Olive oil on your pizza base, smoosh about with your hands and then cove with cling film. If you haven’t got a child or someone else to do the other pizza base, repeat with the second half of the dough. Leave the pizza bases, covered in oiled cling film, in a warm place until doubled in size, or placed on separate shelves in the fridge for a few hours until needed. When ready to assemble the pizza first preheat the oven to 220C/200C fan. I find it easiest to have all the ingredients prepped and ready before I start assembling the pizza. 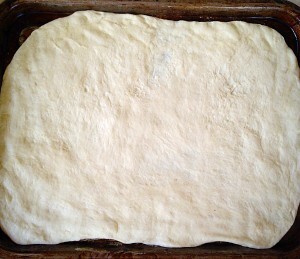 In fact when I make pizza with little people, reckon on 1 x 500g batch of pizza dough to make 4-6 individual pizzas. I also have ham, cheese, sliced peppers (they make great light sabres) in bowls ready for little fingers. Place 2tbsp tomato purée on each pizza base – smoosh to roughly cover the dough. Now add the cheese and other toppings. I have learnt it is best not to overload with toppings, as you will end up with a soggy pizza base. A beautifully, meaty Homemade Ciabatta Base Pizza ready for the oven. As soon as both of the Homemade Ciabatta Base Pizzas are ready, place in a hot, preheated oven and bake for 20-30 minutes. The pizzas are cooked when they are crusty around the edges and cooked through in the centre. I test this using a knife, the centre won’t be as crusty as the edges but you should feel resistance. If it’s still soft give the pizza another 5 minutes baking, reducing the heat slightly if the top is cooked. 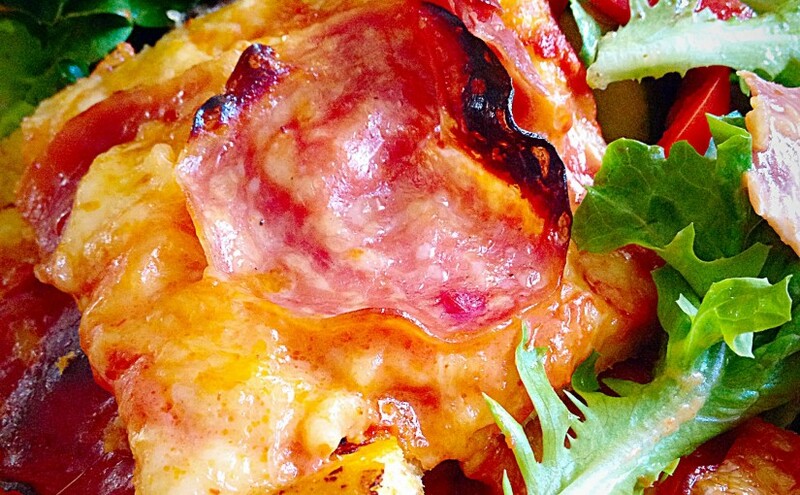 Delicious Homemade Ciabatta Base Pizza. Using a palette knife loosen the pizza around the edges and run it underneath. Slide the pizza out of the baking tray onto a large wooden board, or I have glass worktop saver (don’t use knives on glass it’ll blunt them) which I only use for pizzas. Cut into squares using a pizza cutter. There are usually get 15 squares per pizza. 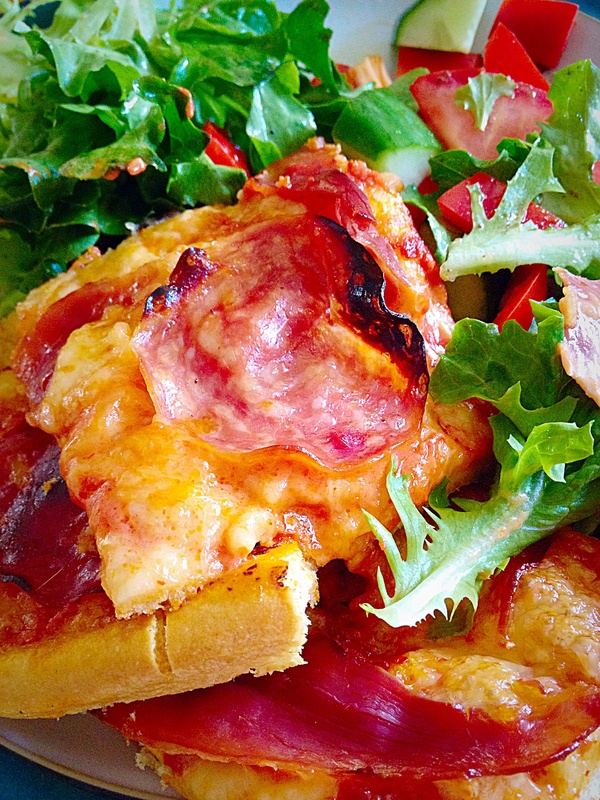 And serve your Homemade Ciabatta Base Pizza – here with salad. 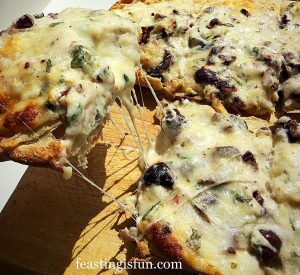 This Homemade Ciabatta Base Pizza is so easy, adaptable and reliable that makes it perfect for parties, buffets, weekend meals, sleepovers the list is endless. 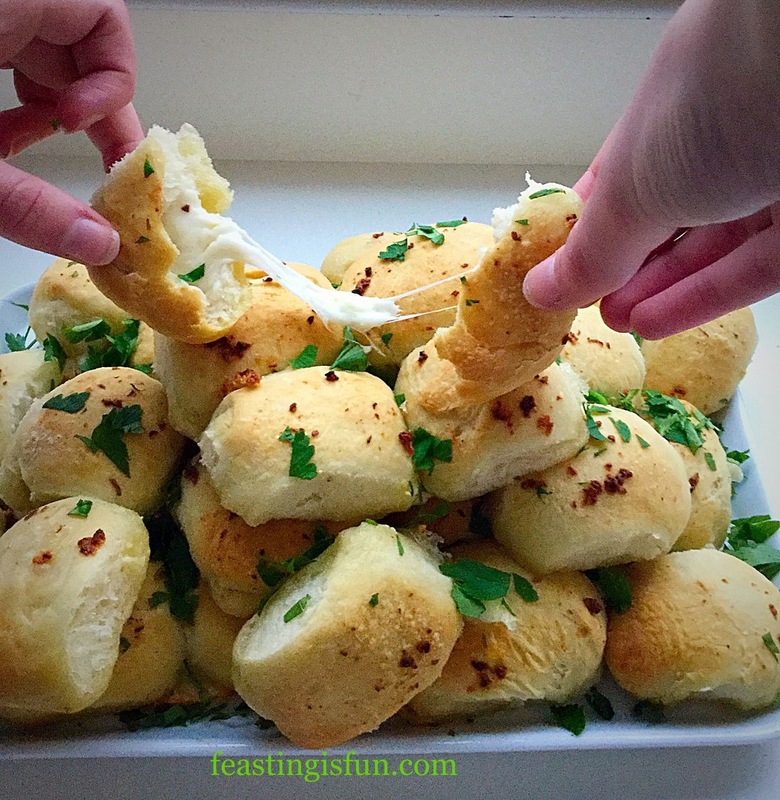 The perfect food for Feasting, Sharing and having Fun! Homemade pizza can be so much fun. Since you are fully in control of the toppings you can add as much, or little as you like of your favourites. Also you can adapt parts of the pizza to suit individual tastes. For example by adding chopped jalapeño pepper to one half and not the other. Likewise, for those who dislike cheese, it is easily omitted. This looks amazing! Pizza is my favourite food and I love making it at home! Thank you Rachel. I think it’s so much more fun, you can make them exactly how you want! Thank you Emily for your lovely comment. I’m about to post a recipe for Tomato Thyme Garlic Focaccia Bread and the dough base also works very well for pizzas.